If you are one of the many runners or triathletes who routinely run on the roads because the trail isn't comfortable or intimidates you, or is a place you tend to get hurt or frustrated, read on. I used to feel that way too! Getting off-road can drive your run fitness and health up by introducing varied, often hilly terrain that simultaneously strengthens your hips, legs, AND heart. The problem is, the trail (especially a technical rock strewn trail) presents its own series of challenges that often make the intimidation factor even larger. For instance, do any of these scenarios sound even remotely familiar to you? You've just climbed a steep hill and you're standing at the top, looking straight down the other side at a technical, very steep descent that is littered with rocks, roots and ice-like leaves. You hesitate for a moment, visualizing yourself slipping and falling or going headfirst into a tree. You decide to go for it, taking off slowly, cautiously, nervously tip-toeing, and praying you don't slip and fall or roll your ankle. You're running along and see a very technical rock "scramble" and a stream, and gaze nervously because you aren't sure where to put your feet down OR how you'll possibly avoid rolling your ankle. You decide it's better to be safe rather than sorry so you walk (rather than run) through the scramble, staring down nervously the entire way. You decide to take the advice in this article and venture off-road for your next run. Alas, 10 minutes into the run and you've fallen twice, rolling your ankle. It hurts, you're frustrated (and angry) and immediately look for the nearest exit back to your safe haven - the asphalt! To help you not only avoid the above scenarios (and many others just like them), here are some TIPS that I've learned the hard way. My mistakes will save you trial and error (and injury I hope), making you a true LOVER of the trail as I am now. Make like a duck: Whenever you approach a technical rocky downhill, try turning your feet outward into a duck-like stance. Doing this may feel strange at first, but it actually helps improve stability and will reduce the chance of you rolling your ankle. When the dreaded ankle-roll happens, our foot will usually roll laterally, or inward. Turning your feet out will make this much less likely. You'll learn to descend with much more confidence. Tread lightly: Good trail runners are highly skilled and light on their feet. Through many miles of practice, they've learned how to instantly unweight their feet when stepping onto an unstable surface, or when they can't see what is below the leaves or brush. When running on asphalt we typically don't give any thought to how hard we land. If you take that same approach on the trail, your risk of an ankle sprain increases dramatically. Learn how to instantly and skillfully unweight your foot. Practice it routinely and it will soon become second nature. Fly like a bird: Runners who usually run on the roads typically keep their arms close to their bodies. However, when you're out on the trail, spreading your arms out wide (picture a bird or an airplane) will help you maintain better balance, improving your ability to move laterally as the trail changes in front of you. Your flow and rhythm will improve, not only helping you to more easily handle whatever the trail might throw your way, but improving the fun factor too! You'll learn how to confidently gaze farther ahead, rather than looking down. You'll use the rocks you approach on the trail as stepping stones (keeping you out of the stuff you CAN'T see). You'll learn to relax and enjoy it more! Now get out there and have at it! 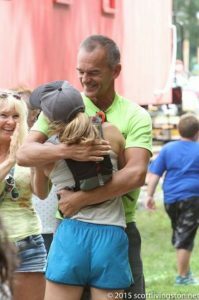 If you'd like to learn more skills and increase the fun factor, becoming a better, faster, happier trail runner, click HERE for more information on our upcoming Cedar Lake Trail Running Camp and Retreat from May 29-31, led by Debbie Livingston and Coach Al. It is for all levels and abilities, even newbie trail runners. We'd love to have you join us for the fun, comraderie, and learning! Team PURSUIT triathlete Megan Pennington, on her way to the OVERALL WIN at the Litchfield Hills Triathlon! Whether it's right here in our Pursuit Athletic Performance lab during a gait analysis, or out on the trail or road OR over a beer at the local pub, we always relish the opportunity to talk to anyone about running. (Anyone who knows Coach, KNOWS how much he can talk, talk, and talk some more about this topic!). No apologies necessary though - running has been a passion of Coach Al's since first running "Boston" in 1983. Every so often though, a conversation with a frustrated triathlete turns to a sort of self depricating exchange where they end up telling us (trying to convince us, or themselves, perhaps?) why they CAN'T be as good a runner as they really would "like" to be. Whether this self-doubt stems from a long period of training struggle or chronic running-related injury, the bottom line is that most triathletes have much more running ability inside of them waiting to get out than they realize! They just don't know how to GET it out! In the podcast, we offer some real and practical suggestions to take your running to a new level. No! It isn't necessarily about planking, more of it, or doing it differently. No, it won't necessarily be "easy." While we offer some practical suggestions that you CAN implement tomorrow in your training, the truth is that it generally takes a long time to "get good" as a runner, all things being equal. Also, we jump in on some questions about all things swim training for the triathlete. Is it REALLY worthwhile to spend time doing kicking sets if I am racing in a wetsuit and generally never kick in a race? Why is the coach writing "hypoxic" sets for us anyway? Is it really valuable, and if so, why? Thanks for joining us! Make it a great day! 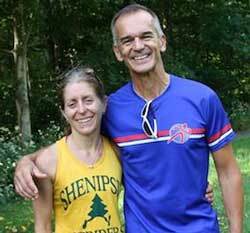 It is my true pleasure to introduce you to one of the outstanding athletes I coach, ultrarunning champion Debbie Schieffer Livingston. 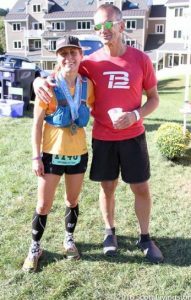 I think you will really enjoy this interview as we cover a host of topics including how Debbie prepares for running distances up to 100 miles, how she recovers, her thoughts on the value of functional strength training (hint: she says it makes a "huge difference"), fueling and hydration, and the mental challenges she faces when running such long distances. Debbie has been running ultras for more than a decade. She is equipped with with a wealth of experience and broad perspectives. Plus, she is the nicest person you could ever meet! We filmed this interview in the Massachusetts Berkshires at the Mt. 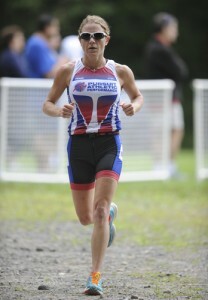 Graylock Trail Races Half Marathon where Debbie was third woman overall. That's impressive enough, but what is truly mind blowing is that she did the Mt. 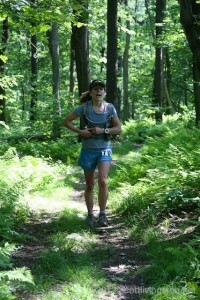 Graylock race only SIX DAYS after her record-breaking performance at the Laurel Highlands 70.5 Ultra! In that race, Debbie smashed a 22-year course record by 12 minutes! (You can see her Laurel Highlands race report here.) Her results tell you this is an athlete who has learned how to put all the pieces together. Debbie is truly an elite athlete, but as you listen I think you will see that issues regarding smart training, recovery, strength work, flexibility, fueling, and taking the long view apply to all of you too. At least that is how we guide and train ALL our athletes at Pursuit Athletic Performance, whether you are breaking records or gearing up for your first 5K. Hello everyone! Coach Al here. 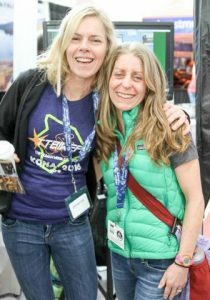 I am very excited to announce that I have partnered with Ultra Running Champion Debbie Livingston to host a five-day trail running camp and retreat in beautiful Sedona, Arizona! The camp will be held Sunday, April 15 to Thursday, April 19, and we have no doubt it will be the experience of a lifetime! The camp and retreat will be hosted at the spectacular Red Agave Resort in Sedona. Debbie and I see this as more than just a running camp. This five day "running retreat" is an educational and inspirational experience designed to develop you as a COMPLETE runner. As we run, eat, and live together, surrounded by the magical red rock formations of Sedona, you will be immersed in aspects of training that are essential to becoming a stronger, faster, and mentally-tough competitor. There is no doubt you will emerge a smarter, reinvigorated runner equipped with the tools you need to make you faster and more resilient--ready to unleash your highest running potential. The Sedona retreat is also the ideal lead-in to the legendary Zane Grey 50 Mile Endurance Run to be held April 21, 2012. Debbie is competing in the race. If you are already registered for this challenging event, the retreat in Sedona is the perfect venue to help you cap your physical conditioning, shore up your mental game, and share an uplifting event with other runners. What a fantastic way to wrap up your training! See our event page for more details. The camp is open to all runners of all levels and abilities who want to improve, learn, and share. It is is limited to 15 athletes - first come, first served! Registrations need to be completed no later than March 18, 2012. Explore the who, what, when and why, plus complete details, bios, and more at the here. 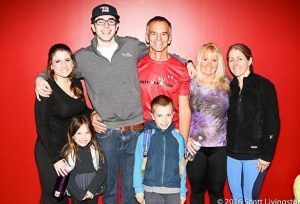 Make the commitment to yourself and to your training in 2012, and register today! Feel free to contact me with any questions. Hope to see you in Sedona!